By paying ReMember dues, you are investing in opportunities to support our collegiate and alumnae membership experience. 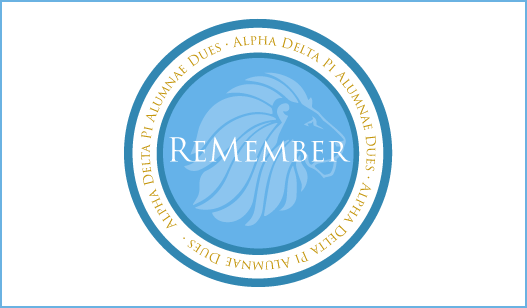 Thanks to the many alumnae who have assisted Alpha Delta Pi by paying their ReMember Dues! Alpha Delta Pi needs your involvement more than ever! In order to sustain these accomplishments, we must commit new resources to the sorority again this year. Your dues will ensure the continued success and growth of our sorority. Please consider renewing your support by paying your ReMember Dues today. Click here to pay your ReMember Alumnae Dues! I thought I was a lifetime member and paid my lifetime membership fee, why am I being asked to donate? You are a lifetime member of Alpha Delta Pi and did pay an initiation fee as part of your lifetime membership. Unfortunately, when that fee was established, there was no way to predict rising mail and paper costs and increasing life expectancies. Our 260,000 alumnae now account for more than 95% of our sisterhood’s membership but contribute merely 1-2% to our operating funds. Each year our alumnae membership grows, as does the cost of providing alumnae services. Aren't $30 annual dues relatively low compared to other national and professional membership organizations? Yes, the amount is very low. Junior League, Rotary and many other membership organizations charge annual fees five or even ten times higher than our $30 annual ReMember Alumnae Dues. As a result, these organizations are able to provide their members significant services. Alpha Delta Pi Executive Office has only 20 paid staff to serve our nearly 260,000 current members. With more alumnae paying dues, we can increase services to our members and expand our technological capabilities. Don't alumnae already financially support Alpha Delta Pi through the Foundation? Yes, many sisters do, and for that we are extremely grateful. Donations to the Foundation make a significant contribution to our philanthropic goals of scholarship, leadership development, support of the Ronald McDonald House and sisters in need. However, the IRS highly regulates how this money can be spent. ReMember Alumnae dues pay for items the Foundation cannot pay for, such as technology development, marketing/public relations, and membership materials for chapters and associations. How will the money collected be spent? Grand Council has a fiduciary responsibility and obligation to best allocate the organization’s financial resources to further the mission of the sorority. Input is provided by more than 150 International Officers who volunteer as part of teams to develop programs, carry out goals and oversee budgets. All aspects are reviewed and evaluated annually to determine each year’s budget. Additionally, as part of ADPi’s strategic plan, members are asked through focus groups and phone interviews to help determine the direction and future of our organization. How can I stay connected to Alpha Delta Pi and show that I believe membership is a lifelong commitment?